The concept of being in the present moment has become synonymous with our idealized sense of peace and well-being. This idea has been lauded so much over the past decade by psychologists, spiritual leaders, and pop-culture authors that many of us have come to believe that thinking about the past or the future is something to be wary of, if not the very culprit of our mental distress. But as happens with ideas of iconic proportion, when the context is lost, so is the meaning. The phrase being in the present moment comes from the idea of being mindful, which has its origins in Eastern philosophy and religions. Mindfulness is a mental skill that increases awareness through our ability to focus attention, and it is used as a tool in many forms of cognitive psychotherapy. Despite its origins, mindfulness has nothing to do with religion, nor is it about thinking of any one time frame. Mindfulness is about being consciously aware of thoughts and feelings that are happening in the present moment, as opposed to being in default mode. If you’ve ever been driving and passed your exit on the freeway or arrived at your destination with little recollection of how you got there, you were operating on autopilot, in default mode. To reduce the load of data that our brain has to process, we consolidate the information we’ve learned into automatic or procedural processes. This allows us to do more by thinking less. We are more able to multitask, but the downside is that we aren’t giving our full attention to our experiences and thus aren’t fully engaged, and perhaps, more important, we aren’t as able to make conscious choices. When you aren’t using your mind to consciously decide your actions, you are just doing whatever you’ve learned to do in the past. This can make it very difficult to break bad habits and choose new ways to do things. The reality is we can only experience thoughts and emotions in the present moment; it is the only place we exist. However, in the present you can, with conscious awareness, think about any time frame, past, present, or future. If your goal is to lead a fulfilling life, then how you allocate your thoughts in these time frames matters. The past is gone. We can never bring it back, except by bringing our attention to it. The present, no matter how awful or sweet it may be, is constantly leaving. It is what just passed. Holding on to it is impossible. The future, however, is constantly arriving. The arrival of the future and the now we live in are one and the same. For the most part, what arrives in our present to become a lived experience is not an accident. We have the power to greatly influence the future by consciously making present-moment choices that are consistent with the future we want. Practicing mindfulness can slow us down, take us out of default mode, and give us a window of opportunity between thought and action, where we can make a choice to allow a better future. It is how we think about the future that determines whether the outcome is beneficial. You can think about what you want and how to make it happen, or you can think about what you don’t want and worry about how to prevent it from happening. The first way increases your chances of bringing positive emotions and experiences into your life, while the second causes you to experience negative emotions about things that may never happen; further, it decreases the amount of time and energy you have for creating positive experiences. Most of the time, when we are operating on autopilot we are simply projecting into the future what we have learned from past experiences and then acting accordingly. If you have had several failed relationships, for example, you may expect that a future relationship will fail as well. Here is where mindfulness can be very useful in changing your future. When you are able to be mindful about what you are feeling at any given moment, you can use this information to help you recognize the type of experiences you are in the process of creating. If you start to think about the future and you notice a negative emotion, such as fear or guilt, you can stop and do a check-in with yourself. Whether the future experience you are thinking of is in five minutes, five days, or five years, ask yourself if it is something you want to have happen. If the answer is no, then this is your moment of opportunity to change the outcome by asking yourself this next very important question: What would I like to have happen instead? As you start to answer the question, you are shifting your thinking into a whole new direction, toward a positive outcome or a solution. As you picture a new, more desired outcome, you have created a target destination, which is the first and most important step in creating any new future experience. Once you have a destination, you can ask yourself the next very important question: How do I get there? As soon as you do this, you create a cognitive dilemma that activates the brain’s executive network (the problem-solving area of the mind), which will work on helping you generate a solution. The longer you stay mindfully focused on this question, the more new ideas and solutions will come to you. You can then consciously choose which ones to act on. New actions will create new experiences in your present moment. Mindfulness can play a big role in your ability to consciously create your life. In essence, mindfulness is about being present, not thinking about the present. When we are present we are in our full power to notice our emotional guidance and to own our thoughts and behaviors; only then do we have the real opportunity to create and experience the life we choose. 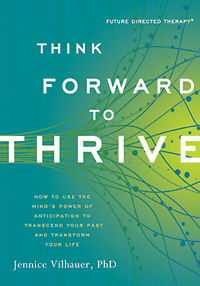 Jennice Vilhauer, PhD, is the author of Think Forward to Thrive: How to Use the MInd's Power of Anticipation to Transcend Your Past and Transform Your Life and the developer of Future Directed Therapy. Which Habits Might Foretell Our Resistance To Being Present?